Year after year, product safety tops the list of concerns for CPG manufacturers. Recent vast product recalls have highlighted the severity of when process errors occur and the irreversible damage a recall can do to a brand. While no process can be 100% safe, a properly run process is the foundation for the creation of a safe product, and real-time process information provides great value if a problem should arise. Production Management - Provides complete tracking of production manpower, machinery and methods used to make a product. Material Management - Tracks & traces all raw material lots and vessels utilized in the manufacturing process. Quality Management - Helps to ensure all quality tests and results are executed and the results are within parameters that indicate the product was made safely. 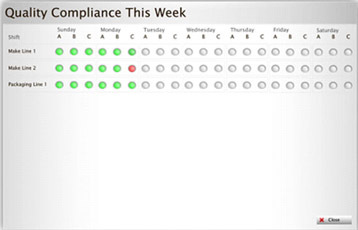 Ideally manufacturers want instant feedback of the process to ensure compliance during the production phase. In this world of instant communication, it's imperative to have an instant solution to rely on when the brand's reputation could be in question. If a product safety issue is discovered, it's vital to retrieve all relevant production information quickly so the root cause may be identified and the finished product can be held back from release. Genealogy reports and actionable KPI dashboards provide the value-driven information needed to assist production in ensuring safe products are manufactured. Product safety is the number one concern for manufacturers, with brand protection the primary goal. Brand can dictate the success or failure of a business. The CPG Suite of Applications provides a comprehensive product safety solution that helps to promote brand security and success. Investigate further by selecting the links below.